The Saehan Cycle is a professional pedal exerciser aimed at rehabilitation. Pedalling improves blood circulation and will increase strength and flexibility after an injury or for elderly. Both the Home and Clinical Saehan Cycles include attachments to fit this professional pedal exerciser to a chair or even a wheelchair. 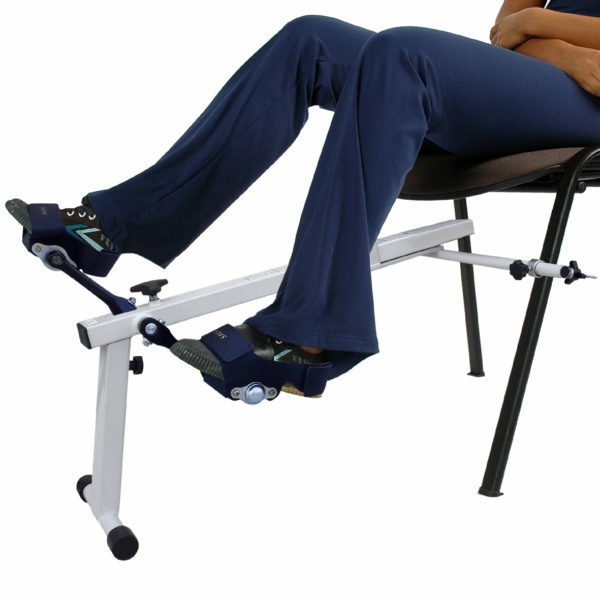 The pedal exerciser’s length can be perfectly adjusted to the user when his feet are fitted in the pedals with foot straps. A convenient turning knob makes it possible to adjust the resistance (0 – 13 kg) which increases or decreases the effort, resulting in a progressive exercise programme. The Clinical version from the Saehan Cycle has an even higher level of adjustability. The distance between pedal and crank can be adjusted and the resistance knob indicates the level selected. Together with the convenient grips to attach the Saehan Cycle to a (wheel)chair and different extra accessories, this product will be an essential item in any professional’s practice room. Because the Saehan Cycle – Clinical is a product aimed at professionals, we offer various accessories to increase its flexibility and user’s safety. Be aware these do only apply to the clinical cycle, not to the home cycle. Check our professional Saehan products here.